Jane Foster began her career as the nurse working with Dr. Donald Blake. She started developing feelings for him and for Thor, not realizing they were one and the same until Thor revealed his secret identity. Because of her association with Thor, she was menaced and manipulated by an entity named Fear, who coaxed her int comitting suicide. Sif saved her life, though Jane was then exiled to a pocket dimension until Thor and Sif saved her again. On her return, Jane falls for and marries Dr. Keith Kincaid. Later, Jane becomes a doctor and is in a position of authority over several New York paramedics, including Jake Olsen - Thor's new identity. When the superhero Civil War raged, Jane took Captain America's side, operating out of SHIELD safehouse 23, healing the wounded. Jane learns of the return of Donald Blake and Thor, divorcing her husband (and losing custody of her child). With Blake, she opens a medical practice in Broxton, Oklahoma, site of the returned Asgard. Later diagnosed with breast cancer, Jane is invited by Thor to represent Midgard in the Congress of All Worlds on Asgard. She refuses magical treatment for her cancer. Something during this Congress causes Thor to become "unworthy". Stumbling across Mjolnir, Jane claims it and is transformed into the new Goddess of Thunder, fighting off Malekith, Minotaur, and the Absorbing Man in the early days of being the new Thor. Odin and his brother Cul send the Destroyer against Jane, as they are angry someone else has Mjolnir. With the help of Thor Odinson and assembled heroes, she defeats the Destroyer. During the time when Doom ruled the cobbled-together remnants of the multiverse as "Battleworld", Jane infiltrated the Thor Corps and convinced them to rebel against the tyrant. Despite working well in teams, Jane has a habit of striking it out on her own, to prove she is still capable and to prove she is just as good as her 'predecessor'. Despite connections to superheroes giving Jane many easy ways to overcome problems (such as magic to cure her cancer) and despite the naysayers who insisted the transition from nurse to doctor would be near-impossible, Jane has repeatedly shown herself to be too stubborn to fall to the words and opinions of others, when they try to sway how she will live her life or how she will do things. That isn't to say she can't consider other opinions or options, but if she has made up her mind, she cannot and will not be swayed. Jane is smart, quick-witted woman. She easily latches onto new concepts with little explanation needed, and can often figure her way through new information without a guide. A prime example of this is how quickly she adapted to the abilities bestowed by Mjolnir, learning to use the hammer in ways her predecessor had not considered. Jane's motivations have not changed, no matter how complicated her life has become. She wants to leave the world a better place than how she found it, which is why she continues to operate as Thor. Jane has two goals for herself: one, she wants to find a cure for her cancer without resorting to magic (or similar options) and secondly, she wants to be the best Thor she can be. As Thor, Jane gains great strength. Though she has not been 'tested' in any official capacity, she is estimated to be the equal of the original Thor before he became unworthy. Jane's resistance as the Goddess of Thunder approaches virtual invulnerability and she is immune to all known diseases of Earth origin. Jane can fly at roughly the speed of sound. The senses of the Goddess of Thunder are considerably improved over Jane's mortal form, allowing her to see further and hear noises much quieter without having to move closer to the source. Under normal circumstances, the Goddess of Thunder can operate for several days without requiring rest of any kind. As Thor, Jane possesses a remarkable healing factor, able to heal injuries and wounds with amazing speed - most injuries healed within a day or two, minor injuries even less. However, the healing factor does not heal her cancer, instead merely suppressing it so that she can act at full strength as Thor. Though most of her storm manipulation abilities require Mjolnir, Thor is able to channel electricity directly through her hands. Thor requires Mjolnir to be in her hands in order to use most of this power (see Electrokinesis for the exception). She is capable of manipulating all aspects of weather with ease. Jane is capable of moving between Midgard and Asgard. Jane can be understood be anyone that can speak a language and she can understand anyone in turn. Jane Foster is licensed to practiced medicine. Jane maintains contact with Doctor Donald Blake, who is still running the clinic they opened together. As well, she is still on good terms with various heroes, such as Thor and Sif. As a licensed and (formerly) practicing doctor, Jane can effect first aid, triage and diagnose based on observation of symptoms and other similar tings associated with being a physician. Becoming Thor and learning on the fly has encouraged Jane how to handle herself. This is nothing so finely trained in as martial arts, but street-style brawling, with Jane using her Asgardian strength to full effect. Jane is fairly knowledgeable when it comes to biology - spefically human biology - what can affect and alter that biology, and how to cure it. Jane has held her driver's license since she was 18, and keeps it renewed at all times. Despite only being Thor for a short time, Jane has become extremely proficient in the use of Mjolnir, down to being able to do things her predecessor never could - like making the hammer change trajectory in mid-throw. 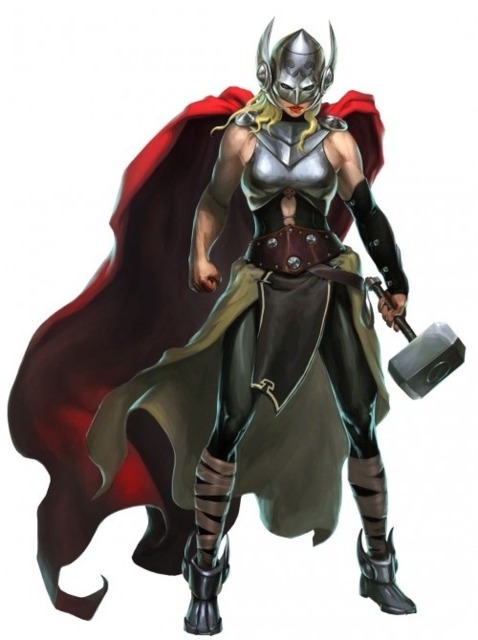 Without Mjolnir, Jane cannot transform into Thor. And when she is transformed into Thor, her powers fade (until she reverts to Jane) the longer she is separated from the hammer. Jane Foster suffers from cancer. As such, she undergoes treatments - particularly radiation - which leave her weak and without energy, meaning she can't work (or anything really) as effectively as a healthy person might. Jane has inherited many of Thor's enemies, simply by virtue of calling herself Thor. On top of that, she can also count Odin and Cul amongst her enemies, both of whom are upset that Mjolnir ended up in the hands of a human woman. Despite working well in a group, Jane prefers to work on her own. Though this means she never has to watch someone's back, it also means that villains working in a group can attempt to take advantage of her solitary nature. Doctor Jane Foster is known to be a very competent physician. Thor… confuses people because they associate the name with a male superhero. Despite this, the 'female Thor' has shown herself to be nearly, if not just as, skilled as the 'original male' Thor.